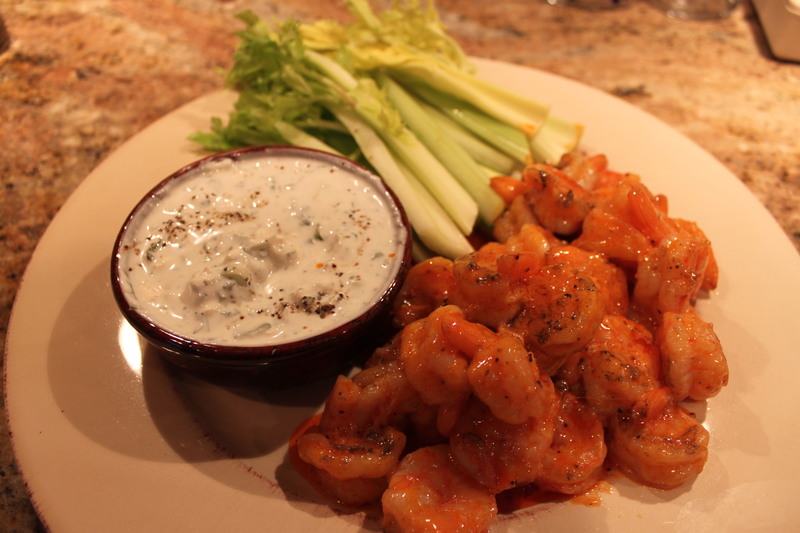 I have been salivating over Gourmet Magazine’s recipe for Buffalo Shrimp and Blue Cheese since it was published last July. I love buffalo sauce, and unlike my slightly finicky friends, I love chicken wings. It took me a year to finally make this dish, but it was the perfect appetizer after a long day of (fake) rock climbing and touristing. Life seemed pretty enchanting as I grilled the shrimp with a glass of rose and a view of the Blue Ridge Mountains. Just like High Grant in Notting Hill said, “surreal but nice” — remember that?? As soon as the butter and Frank’s host sauce melted together, everyone couldn’t wait to dig in. This salty snack suited my friends – especially those who are funny about chicken bones. Prepare grill for direct-heat cooking over medium-hot charcoal (medium heat for gas). Toss shrimp with oil and 1/2 teaspoon each of salt and pepper. Oil grill rack, then grill shrimp, covered only if using a gas grill, turning once, until just cooked through, 7 to 8 minutes total. Stir together butter and hot sauce in a large bowl. Add shrimp and toss until coated. Serve shrimp with dip and celery. ** MMoM note – I skewered the shrimp and grilled them because we didnt have a grill rack.